Customers looking for an affordable trailer hitch receiver for their late model Land Rover have come to the right place! Our trailer hitch receiver is custom-manufactured and offers a less-expensive alternative to the genuine part without compromising quality or function. This high-quality hitch receiver fits a number of Land Rover models including LR3, LR4 and Range Rover Sport. This bolt-on hitch is a permanent installation and includes thread locker to seal bolts in place permanently and eliminate the possibility of bolts loosening with use. Please Note: A Torque Wrench is required for installation. Was exactly what I expected it to do. Straight forward installation. Would recommend this product. I choose this product because it was the best alternative to the land rover product. Overall, the product fit my vehicle as described and without any difficulties. I would recommend this product to others. The service was great and the product matched the service, the teaching videos are of great benefit as well. Excellent quality and great price but the mounted position was a bit too low for my liking. I was concerned that this would have an impact on off-road departure angle so I chose to return it and was given a swift refund- thank you Atlantic British! Let me make it clear this was no fault of AB, just the sort of issue any permanently-installed hitch would have. (Probably the reason LR made the factory hitch removable.) I chose to go with a used LR original (for considerably more money) simply because I tow rarely and could remove it when off-roading. 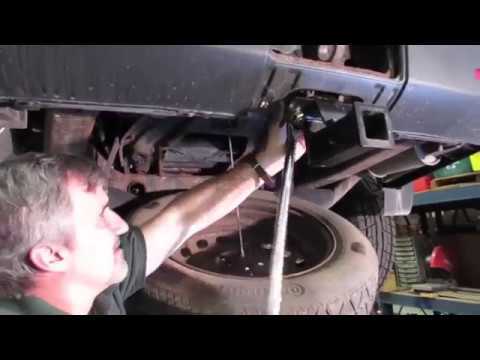 If you tow frequently or if off-road clearance is not a concern then you will be happy with this hitch and save considerable money. Great product. Easy to install. A great alternative to the factory hitch.